In the fourth century A.D. a new dynasty established its authority over a large part of northern India known as Gupta dynasty. They ruled for more than 200 years. Their Empire included Uttar Pradesh, Bihar, Bengal, Madhya Pradesh, Gujarat, Rajasthan, Punjab and north western India. Its influence also extended up to Afghanistan in the north-west, Kamrupa in the east, and Tamil Nadu in the south. The founder of the Gupta dynasty was Sri Gupta. The first important ruler was Chandragupta-I. He married a Lichchhavi princess. He came to the throne in about 320 A.D. He ruled over Saketa (Ayodhya), Prayaga and Allahabad. He was succeeded by his son Samudragupta. Chandragupta-II conducted a victorious campaign in western India against the Shakas who had been troubling the Guptas. He also maintained friendly relations with the king of the Deccan and the south by marriage alliances, the most important of which was with the Vakataka kingdom of the Deccan. Chandragupta-II’s court was adorned by many scholars and poets, including Kalidasa and Amarasimha. It was during his reign that the Chinese pilgrim Fa-hien visited India and wrote an account of the people. After Chandragupta-II, there followed a number of weak kings. To add to their troubles, India was threatened from the north by the Central Asian people, the Hunas in 5th century A.D. Their continued attacks weakened the resistance of the Guptas and finally the Hunas became the rulers of the Punjab and Kashmir. The Hunas were powerful for about a hundred years and then their power declined. But by this time many of them had settled in India permanently and had become a part of the Indian population. The Gupta Empire was divided into provinces called Bhuktis which was governed by an Uparika maharaja. Bhuktis were further divided into districts called Vishayas, each placed under a Vishayapati. There were district councils to advise the governor and these councils consisted not only of the officers but also of citizens from the towns. Some of the officers employed by the Gupta were paid salaries in cash. This system changed under the later kings and instead of salaries in cash, officers were given the right to collect equivalent amount in revenue from land. Taxation remained the main source of revenue. The law was divided into civil and criminal law. The village headman, along with the elders of the village, looked after the village administration. The governors of the provinces were more independent than they had been in Mauryan times. After the reign of Chandragupta-II, when the kings became weaker, some of the governors of the far away provinces behaved like kings. 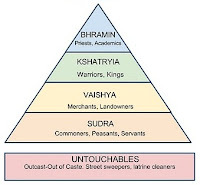 So compared to the Mauryan kings, the direct rule of the Gupta kings was over a small area. Those that paid tribute were not directly under Gupta government. When the Gupta Empire broke up, these governors declared themselves kings of their small provinces. The kings of south soon broke away from Gupta rule. The Shakas in the west raised a new threat. Thus the empire was mainly confined to northern India. People were law-abiding and honest. The laws were mild and punishments were not cruel. Villages were numerous and most of the people were vegetarians. Revenues of the state came from the taxes on cultivated lands. There was one group in the towns which, was badly treated – the untouchables. They had to live outside the town, separate from the rest of the townspeople. They were regarded as so impure that high caste people could not even look at them. Yet they were the people who laboured for the upper castes. Buddhists and Brahmans lived at peace with each other although they had different views. He also speaks in glowing terms about the wealth and prosperity of the country. Crops such as wheat, barley, paddy, pulses, vegetables, cotton and sugarcane were grown. According to the fertility of soil agricultural land was classified. Importance was given to irrigation in this period. Trade was also carried on with western Asia and countries in south-east Asia. However, the trade with the Roman world declined. As trade grew, knowledge of seafaring and ship building also improved. Larger ships were built than before, and many more ships crowded into the ports along the east and the west coast. Tamralipti (Tamluk) in the Ganga delta handled a large part of the trade with countries of south-east Asia, such as Brahmadesh (Myanmar), Suvarnadweepa (Java, Sumatra, Malaya peninsula and Bali), Champa (Vietnam), and Kamboja (Kambodia). Broach, Sopara and Kalyan were the main ports on the west coast and they too sent ships to south-east Asia. Along with trade Indian religion and other aspects of her culture, all made their way to south-east Asia. From the ports on the Malabar Coast, Indian goods were taken to Africa, Iran and the Mediterranean lands. Caravans of traders and missionaries of religion travelled overland to central Asia and China. However, towards the end of the Gupta period, trade in northern India began to decline. The town of the Ganga plain shows signs of decay. This was in part due to disturbed conditions in Central Asia with the movement of the Hunas. It may also have been due to changes in the environment in the Ganga river system with floods and changing river courses. 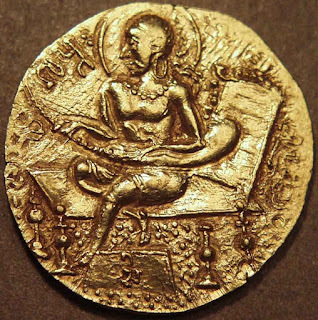 The Gupta kings issued a large number of gold coins which depict kings, gods, and goddesses on them. Vaishnavism and Saivism became popular in this period. Both marked by bhakti and ahimsa. It was believed that Vishnu sometimes comes to earth to help men lead good lives, and this is called an Avatara or Incarnation (as he takes an animal or a human form). Now the Brahmans explained that devotion to Vishnu through prayers and hymns was more important. Images of the gods were worshipped and placed in a small room which was called the Deva-griha. Images of Brahmanical gods and goddesses and Jain Tirthankaras and of the Buddha and Boddhisatvas were also made. Many of the older books such as the Ramayana, the Mahabharata and some of the puranas were added to or written at this time. They now came to be treated as religious literature. Gupta kings were either the worshipper of Vishnu or Shiva but most of them were Vaishnavas. They also performed religious sacrifices such as the Ashvamedha. Religious sacrifices were held in this period but not as often as in Vedic times. The kings gave donations for building temples. A large number of caves at Ajanta and Ellora were excavated belongs to this period. In the field of mathematics and astronomy Aryabhatta wrote the Aryrbhattiya. He suggested that the earth revolves around the sun and rotates on its axis. Another noted astronomer was Varahamihira. By astronomical calculations they could predict the eclipses accurately. Surya Siddhanta is the best known work on astronomy in this period. Indian mathematicians used the decimal system and also introduced zero. The Indian system of mathematics and decimal system was adopted by the Arabs. From them it was learnt by the Europeans. The Arabs built their Islamic empire in the 7th and 8th century A.D. The sea and land routes came under their control. So the Arabs became the link between India and Europe. The iron pillar at Mehrauli in New Delhi built in the 4th century A.D. is a fine example of iron technology. Books on medicine were also written. The period beginning a little before the reign of the Guptas ushered in the glorious period of Sanskrit literature, particularly secular. This was the greatest period of poetry and drama. The great writers of this period are well known–Kalidasa, Bhavabhuti, Bharavi, Bhartrihari, Magha and many others. Kalidasa lived for some years at the court of Chandragupta-II. Kalidasa’s most famous work is the Abhijanashakuntalam and poems like Kumarsambhava, Meghadutta and Raghuvamsha, provide a vivid picture of Gupta society. Among the other famous works of this period are Bhavabhuti’s Utter-Ramacharita, Bharavi’s Kiratrjuniya, Vishakhadatta’s Mudrarakshasa, Shudraka’s Mrichhakatika and the seventeen plays of Bhasa. Dandin wrote the Daskumaracharita. The subjects of these and other works were political events, romances, allegories, comedies and philosophical questions. Besides these, there was also a growing body of philosophical literature. There were also great collections of tales and stories. The most famous collections are the Panchatantra and the Kathasarit-sagar. The study of language, particularly grammar and lexicography, was very advanced. The Gupta period also marked the beginning of temple. These temples were not in the form of caves cut into the hills as at the Ajanta and Ellora, but were constructed of materials like brick and stone. The early temples were very simple, consisting of just one room where the image of god was kept. This was the Garbha-griha. Examples of these temples are at Bhitaragaon and Deogarh (Kanpur and Jhansi district of U.P.) and at Sanchi (Vidisha district of M.P.). The entrance to this room was decorated with sculpture. Gradually the number of rooms increased from one to two, three, four and many more until in later centuries, the temples became large and several buildings were included in the temple courtyard. There was a large Buddhist monastery at Sarnath near Varanasi. Here stone images of the Buddha have been found. Some of the Buddhist monasteries were in caves cut into hill sides. One of these was at Ajanta near Aurangabad. The walls of the caves were covered with paintings (murals) depicting the life of the Buddha. The varahavatar depicted in the Udayagiri cave is a very impressive one. More than a thousand caves from about the second century B.C. to tenth century A.D. were excavated in different parts of India. Most of them are Buddhist; some are Hindu and Jain. Beautiful chaityas (worshiping halls), Viharas (Monasteries), mandapas, rathas and cave temples have been cut out of rocks.